Fixing Duplicate Variants – How can we help? Having duplicate variant products is a common error that occurs for many retailers, particularly after importing their products via a CSV. 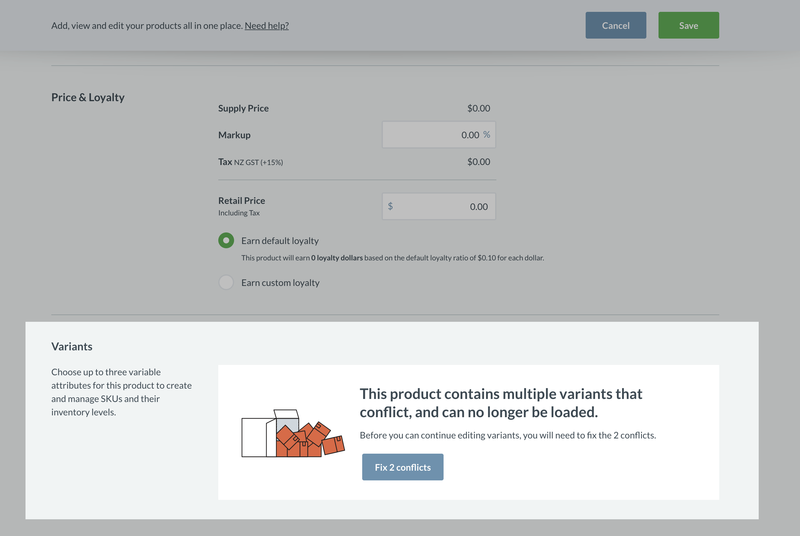 When editing your products, Vend now has a tool that checks whether you have duplicate variant products that conflict and walks you through how to fix the conflict. This allows you to continue editing your variant products with ease. When you edit your variant products in Vend, your variant products will be put through the new tool so that Vend can run a quick check on your variant products. The tool will check for any duplicated variant attribute errors, such as size and colour, and will let you know if any errors are present in the variant products you are editing at the time. 1. 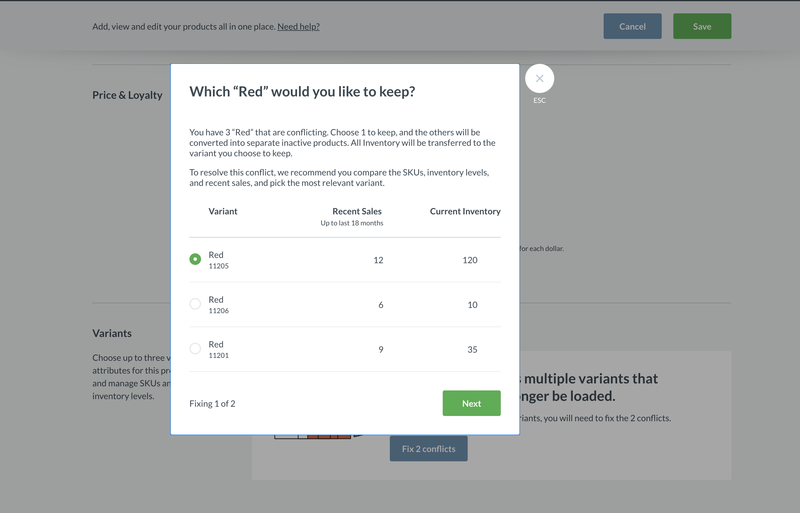 When you go to edit your variant products on the Edit product page, the tool will automatically check whether your variant product has duplicates and are in conflict. For more information on how to manage your variant products in Vend, check out this article. 2. A message will appear in the Variants section (at the bottom of the screen), informing you whether you have any duplicated variant products. The message will also inform you how many conflicts you would need to fix. Important: You will need to resolve the conflicts before you are able to make further edits to your variant products. 4. Click on the button stating how many conflicts need to be fixed. In the example below, it indicates Fix 2 conflicts. 5. A new window will open highlighting the specific variant products that conflict. You will be required to Choose 1 ("winning variant") variant product to keep. Any variants you choose not to keep ("losing variant") will be converted into separate inactive products. All inventory will be transferred to the variant product you decide to keep. If you do not want the inventory to be transferred to the variant product that is being kept, you will have to adjust your inventory AFTER you have created the variant product without conflicts. 6. Compare the SKUs, inventory levels and recent sales of the products and choose the most relevant variant product. Select Next. 7. If you have other conflicting variant products to fix, follow the steps above again, but for the next group of variants. Select Save Changes once you are done. 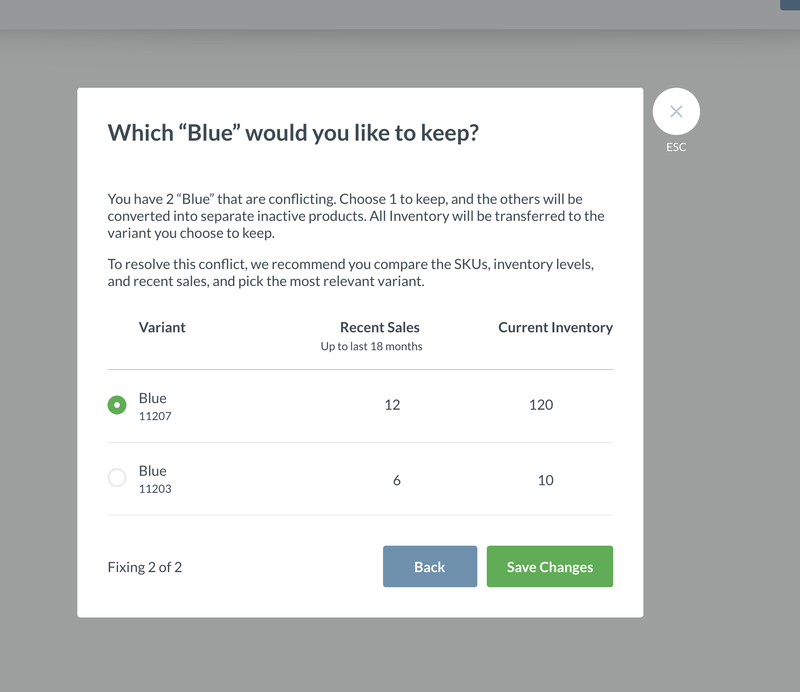 Now that you have fixed the conflicting variant products, you will be able to continue editing your variant product and load them into your store. Note: Once you have edited your variant products, we recommend that you perform a partial inventory count on the winning variant product you have just edited. This ensures that you have the correct inventory count for the winning variant product. If you have a composite product that contains a losing duplicate variant product (the variant product you chose not to keep in the process above), its inventory may be incorrect. This is because all the inventory for the losing variant product was transferred to the winning (the variant you have chosen to keep) variant product when fixing the conflicts through the tool above. Replace it with the winning variant product.